Less than 30 km from Peiting lies Neuschwanstein Castle, which King Ludwig II of Bavaria began to build in 1868. It rests on a rugged hill, situated almost 2000 m high in front of Tegelberg mountain. 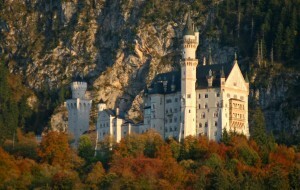 He built it high above his father’s castle, Hohen-schwangau, and never completely finished it. 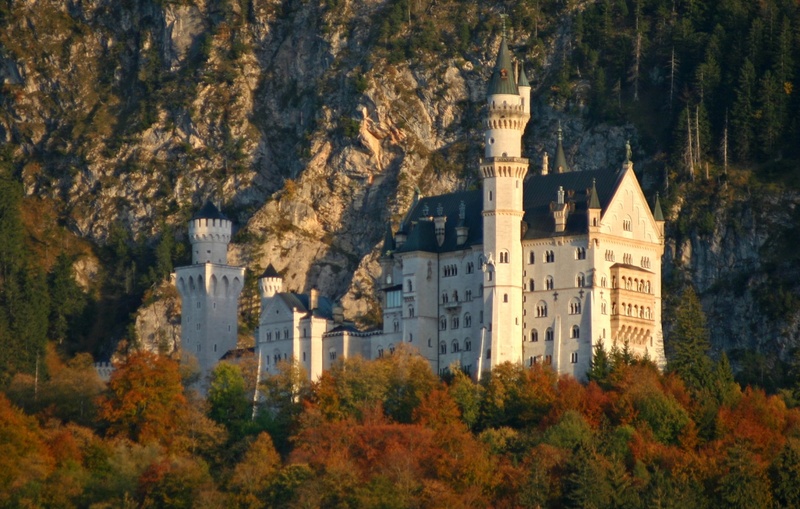 Neuschwanstein for him was a landmark of culture and the monarchy of the Middle Ages, which he adored and wanted to reproduce. Designed and furnished in a medieval style, but using the most modern technology of that time, the castle is one the world’s most famous examples of architecture and a key symbol of German idealism. The interior features wall murals from Norse and knight mythology. The singer’s hall admiringly presents two rooms in the Wartburg; the throne room, a sanctuary of rulership, is inspired by Byzantine and Early Christian churches. Before King Ludwig II died in 1886, only the fifth floor Palas was finished. Rather symbolically, the Throne Hall was missing the throne when the King, incapacitated, was brought from Neuschwanstain to Berg Castle on Lake Starnberg. The queues for tours can be long during the summer. To avoid waiting, you can book a time slot for the tour in advance at the Ticket Centre. Tours take place throughout the day (approx. 35 minutes) in German, English or with an audio guide available in eight languages.